A fascinating, yet not fully developed technology of using light to modify the DNA of neurons in living organisms has just been employed as a painkiller in mice, paving the way for very effective and inexpensive cure for pains in humans. Optogenetics is a very high-tech method for controlling nerve cells, and although around for a few years, continues to yield amazing discoveries. People’s fascination with it lies in its ability to be used for controlling nerve behavior in living things with surgical precision. Having just performed new tests on mice, this time around, researchers at Stanford University in California hope that removing or blocking pain will soon be as easy as pressing a bright flashlight to the affected area. They partnered up with a company called Circuit Therapeutics – a leader in optogenetics – and published their findings in the journal Nature Biotechnology. Michael Keplitt is a neurosurgeon and chief scientific officer at Circuit Therapeutics, a three-year-old California-based biotech startup that in a short while has already taken the lead in propelling optogenetics to stardom. “Patients could be given their own ability to create a pain block on demand,” he wrote of the technology that could be used for directly controlling nerve behavior. The technique has been around for nine years in one form or another. 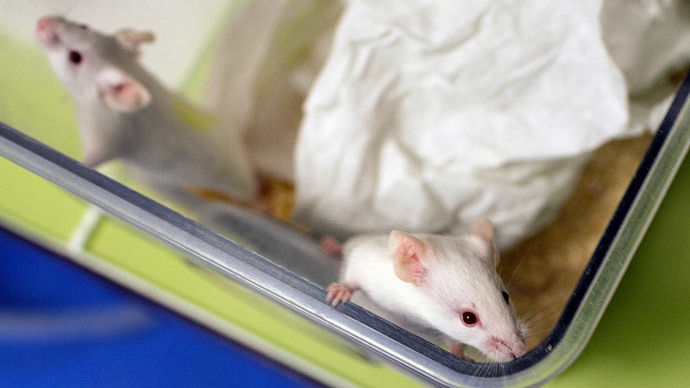 When first conceived by Karl Deisseroth, one of the authors of the study and the creator of Circuit Therapeutics, the technique was used to inflict and take away fear in mice. A lot of optogenetics experiments work simply by shining a light onto the area where the pain is, blocking the neurons from firing. But an even more daring method has been tested as well, where a tiny fiber-optic cable is used to shine a ray directly into the brain of an animal. In future, the company also hopes to develop that further; however, for the time being, working on areas outside the brain is more practical and easy. The reason for this is that the nerve endings affected by the light are located incredibly close to the surface of the skin and therefore take no effort at all to reach. If the idea that using a simple flashlight-type device to cure pain sounds crazy, it’s because the very perception of pain is different from reality. “Pain is a perception. So the idea is to stop the perception of it,” Kaplitt said. The study the two teams undertook worked by embedding light-sensitive molecules under the thin upper layer beneath the skin of mice, right into the nerve endings. They were then placed in their own little plexiglass chambers, and the experiment began. A blue light would be shone through the floor, and it would cause pain: mice would either cry out or lick their paws incessantly to alleviate it. A different type of light was then used to elicit the opposite reaction by blocking the neurons from firing. When that yellow light was shone onto them, they either felt no pain or were very slow to react to it. And the advantages don’t stop there. The economy here could be very substantial, as around $635 billion a year is being spent on health in the US at this time, according to MIT Technology Review, while the medicine used to kill off pain isn’t always a guarantee, at times leading to bad side effects as well as addiction. Scientists are optimistic, even though progress aimed at pinpointing where exactly to shine the light and how much of it, is slow at the moment. They predict at least 10 years of studies before a workable solution can be manufactured. However, companies such as Google and people from MIT, which helped in the creation of optogenetics nine years ago, aren’t resting on their laurels either. Like Circuit Therapeutics, they are engaged in pooling efforts together to create their own optogenetics-inspired pain killer. Ed Boyden of MIT has just founded Eos Neuroscience aimed at doing just that.